The Discovery astronauts looked forward to a half day off early Monday to relax, share a meal with their space station counterparts and enjoy the view from 220 miles up. Later in the day, they will resume cargo transfer work before gearing up for a third and final spacewalk early Tuesday. Monday is the 49th anniversary of cosmonaut Yuri Gagarin's historic launch on the first manned space flight and the 29th anniversary of the U.S. shuttle program's maiden voyage. Russian space officials planned to call station commander Oleg Kotov, Alexander Skvortsov and Mikhail Kornienko to mark Cosmonautics Day and the Gagarin anniversary. "Tomorrow's a really historic day," said station Flight Director Ed Van Cise. "First, the crew's going to get a half day off, they've been very busy and will be very busy for the rest of the week, so we're giving them a little bit of time off. "But tomorrow's April 12 and that is Cosmonautics Day for Russia and for all our Russian partners and crew members, it commemorates the first human being to fly in space, Yuri Gagarin. He launched in (1961) on April 12." 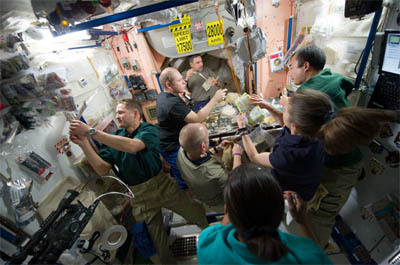 Cosmonautics Day and the shuttle anniversary "is just a good day in general to reflect on the fact that we have a lot of amazing things going on in space flight now," Van Cise said. "We have four women in space for the first time ever, we have two Japanese (astronauts) in space for the first time ever and we have three Russians living long term on space station for the first time. So there are a lot of firsts going on in space right now and tomorrow's going to be a chance to commemorate all those different things. Later Monday, the Discovery astronauts will participate in round-robin interviews with reporters on Earth before calling it a day. Rick Mastracchio and Clay Anderson plan to spend the night in the space station's Quest airlock module at a reduced air pressure to prepare for a planned six-and-a-half-hour spacewalk early Tuesday. The primary goals of the mission's three EVAs are to install a new ammonia coolant tank in the space station's main power truss and to move a partially depleted tank to Discovery's cargo bay for return to Earth. The new tank was moved from the shuttle to a temporary mounting point during the crew's initial spacewalk Friday. The old tank was removed and temporarily mounted on an astronaut equipment cart during a second spacewalk early Saturday and the new tank was moved into its place. But Anderson and Mastracchio had problems getting the new tank bolted down and because of time lost resolving that issue, they were unable to hook up ammonia and nitrogen pressurization lines. They also ran out of time to retrieve a set of no-longer-needed debris shields and move them into the station for return to Earth aboard Discovery. Those tasks will be added to the final spacewalk Tuesday, along with a few lower-priority get-ahead items if time is available. "We will complete connecting the fluid lines to the new ammonia tank," Van Cise said. "We'll bring those shields in and we will take the old tank ... with the space station (robot) arm and secure it into the payload bay of the shuttle. "And then we'll have a couple of other items we'll be doing at the tail end. For example, there's (an experiment) platform out on the Columbus module, we'll be taking that off Columbus and putting that in the payload bay so we can bring that home." Mastracchio and Anderson also will install two radiator servicing fixtures to go along with two that were installed Saturday and possibly perform a few other minor get ahead tasks if time is available.